The cause of cardiomyopathy in patients infected with the human immunodeficiency virus (HIV) remains largely unknown, although a number of predisposing factors have been identified. Malnutrition has been postulated to be a contributory factor, but the association of anthropometric measures of nutritional status with HIV-associated cardiomyopathy has not been established. METHOD: We investigated the association between anthropometric measures of nutritional status and cardiomyopathy in HIV-positive individuals in a cross-sectional case comparison study. 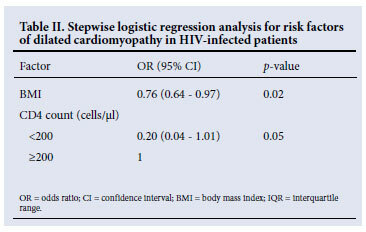 RESULTS: Seventeen cases of HIV-associated cardiomyopathy and a comparison group of 18 HIV-positive individuals without cardiomyopathy were studied. There was no significant difference between the two groups in age, gender, CD4 cell count, HIV RNA viral load or World Health Organization (WHO) clinical stage of HIV disease. Patients with HIV-associated cardiomyopathy had evidence of undernutrition compared with HIV-infected people without cardiomyopathy, as evidenced by a significantly lower body mass index (BMI) (20.9 kg/m2 v. 27.0 kg/m2, p=0.02), mid-upper arm circumference (26.2 cm v. 27.3 cm, p=0.02), and bone-free arm muscle area (26.7 cm2 v. 32.8 cm2, p=0.02). However, in a multivariate stepwise logistic regression model, a lower BMI was the only independent anthropometric risk factor for cardiomyopathy (odds ratio 0.76, 95% confidence interval 0.64 - 0.97, p=0.02). CONCLUSION: A lower BMI is associated with cardiomyopathy in people who are living with HIV. We conducted a cross-sectional study among HIV-infected adults to determine whether there is an association between nutritional status, measured by simple anthropometric criteria that can be applied in routine clinical practice, and HIV-related cardiomyopathy. This investigation of the relationship between nutritional status and cardiomyopathy in HIV-positive patients may be relevant in the development of new therapeutic strategies, including restoration of adequate myocyte nutrition as a goal in the treatment of patients suffering from HIV-related heart failure. This was a cross-sectional study of 17 HIV-positive patients with cardiomyopathy and a comparison group of 18 HIV-positive individuals with no cardiomyopathy. The study was approved by the University of Cape Town (UCT) Health Sciences Faculty Human Research Ethics Committee (REC REF 016/2002), and all participants gave written informed consent. HIV-positive patients with and without cardiomyopathy were recruited from HIV clinics at Groote Schuur, New Somerset and G F Jooste Hospitals in Cape Town. Clinic attendees over the age of 18 years were invited to attend the Cardiac Clinic at Groote Schuur Hospital for clinical evaluation and examination by two-dimensional guided M-mode echocardiography to identify those with cardiomyopathy. The two groups were matched for ethnicity as part of a study of genetic risk factors for cardiomyopathy in people with HIV infection.6 One experienced echocardiographer carried out all the echocardiographic examinations, using a calibrated ultrasound machine with a 2.5 MHz transducer with subjects in the left lateral position. The echocardiographic examinations were read by one cardiologist (BMM). Patients with dilated cardiomyopathy (a fractional shortening of <25% and left ventricular internal dimension >112% of predicted, according to Henry's formula) or patients with left ventricular dysfunction (a fractional shortening of <25% and normal ventricular dimensions) were included in the study.7 Patients with valvular heart disease, hypertension, ischaemic, pericardial or congenital heart disease, diabetes or alcoholic cardiomyopathy and women who fulfilled the criteria for peripartum cardiomyopathy were excluded. Treatment with antiretroviral agents that have been implicated in cardiomyopathy8 was also grounds for exclusion. Normal heart function was confirmed by echocardiography in all individuals in the comparison group. CD4 cell counts were obtained by lymphocyte immunophenotyping using a flow cytometer in the Immunology Laboratory at Groote Schuur Hospital. The HIV viral load was measured by a quantitative polymerase chain reaction assay of viral genomic RNA using the Nasba kit in the Division of Virology at the University of Cape Town. Categorical variables were compared using the χ2 test and continuous variables using the non-parametric Mann-Whitney test. The multivariate stepwise logistic regression model was used to identify independent anthropometric risk factors for cardiomyopathy. All tests were double-sided, and a p-value of <0.05 was considered significant. 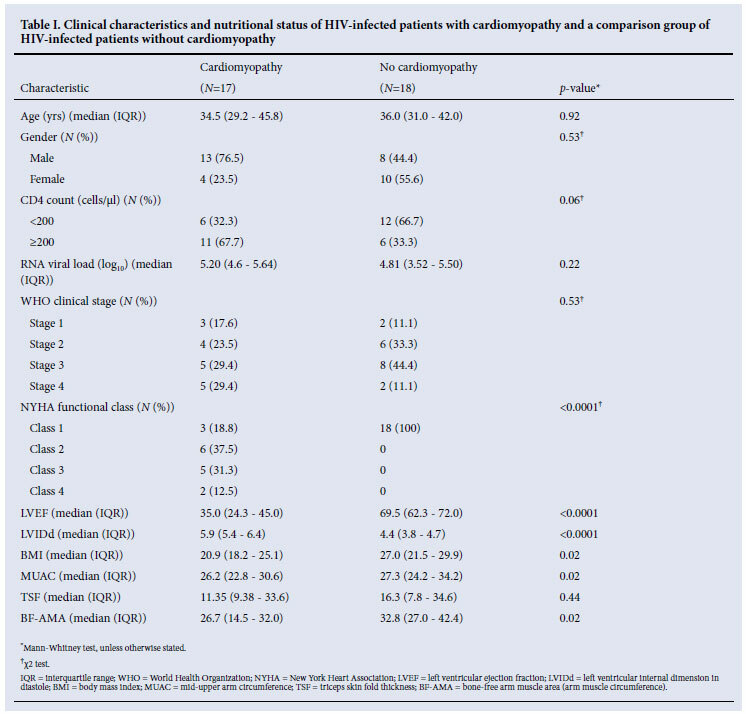 The clinical characteristics and nutritional status of the 17 patients with HIV-associated cardiomyopathy and the 18 HIV-infected individuals without cardiomyopathy are presented in Table I. There was no significant difference between the two groups with respect to age, gender, CD4 cell count, HIV viral load or World Health Organization clinical stage of HIV disease. Although most participants presented with anthropometric parameters within the normal range, HIV-positive patients with cardiomyopathy had significantly lower values compared with HIV-positive patients without cardiomyopathy: BMI 20.9 kg/m2 v. 27.0 kg/m2, p=0.02; MUAC 26.2 cm v. 27.3 cm, p=0.02; and BF-AMA 26.7 cm2 v. 32.8 cm2, p=0.02. However, in a multivariate stepwise logistic regression model, a lower BMI was the only independent anthropometric risk factor for cardiomyopathy (odds ratio 0.76, 95% confidence interval 0.64 -0.97, p=0.02) (Table II). We showed that a lower BMI is associated with cardiomyopathy in people living with HIV. HIV infection profoundly affects nutritional status because it is associated with poor appetite, impaired nutrient absorption, increased basal metabolic rate and opportunistic infections.11 Under-nutrition in HIV patients is manifested by weight loss, loss of lean body mass and micronutrient deficiencies. We compared two groups of HIV-infected individuals who were well matched for the stage of HIV disease. The lower BMI is therefore likely to be independent of HIV infection, and linked to the cardiac disease. Cardiac function is both affected by nutrition and can affect nutritional status. In a malnourished state, relative cardiac sparing occurs - this is especially apparent in chronic disease.11 Cardiac sparing occurs to preserve left ventricular function - even in patients with severe protein energy malnutrition, ventricular mass decreases but the ratio of ventricular mass to body weight remains constant. Heart disease can also have an adverse effect on nutritional status. Chronic heart dysfunction can result in cardiac cachexia, an inappropriate use of lean body mass instead of body fat that results in muscle wasting. This study extends the observations of micronutrient deficiency in HIV-associated cardiomyopathy to include lower BMI, a simple clinical measure of nutritional status that can be applied in resource-poor circumstances of sub-Saharan Africa, which is the epicentre of the HIV/AIDS epidemic in the world. Although micronutrient measures were not performed in this study, our results are consistent with the observation that micronutrient deficiency is predictive of cardiomyopathy in people who are living with HIV infection. These preliminary findings, taken together with the small trials of selenium supplementation in HIV-associated cardiomyopathy, have important implications for the development of new therapies in this field. The time has come to consider the role of nutritional interventions in HIV-associated cardiomyopathy, including the restoration of adequate myocyte nutrition as a goal in treating patients suffering from HIV-related heart failure. This paper is dedicated to the memory of the late Mr Peter Kaye, the echocardiographer who worked pro bono on this project. The expert assistance and contributions of Sister Maitele Tshifularo, Ms Lebogang Montewa, Dr Innocent Monya-Tambi, Ms Terry del Fabbro and Professor Gary Maartens are acknowledged with gratitude. The study was funded in part by the Medical Research Council and the National Research Foundation.